We're heading back to Paterson, NJ to see the SuperFresh (aka Farmboy Country Market) again after our full tour in June 2017. At the time of that original visit, the renovation was in progress and it has now been finished. I supplemented with pictures from Key Food's Facebook page, but now I have my own! The store has certainly gotten more popular. On my two post-renovation visits, the store was significantly more crowded than before. The carts have also changed. No more Food Basics carts. No, sir. Now they use former Publix carts with Food World handles put on upside down. This is not a mistake. Every cart has its Food World handle on upside down. 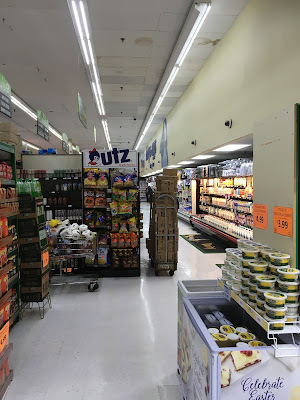 On the other hand, the SuperFresh Food World stores in Belleville and Bloomfield use former Publix carts with Food World handles on the right way. Some even still have the Publix handles. The store now provides delivery with a minimum purchase as well. They were pretty close with that SuperFresh logo! I promise, it gets better inside. I commented on this in the first post, and it hasn't changed -- this store's best feature is the produce department. It's excellent and CHEAP. This decor remains from Food Basics. Looking along the front-end from produce. Customer service is located under the pink banners. The track lighting and flags are new from SuperFresh. The price signs are very clear and are also all the same. Zoom in to see. Here's where we get to see some changes. 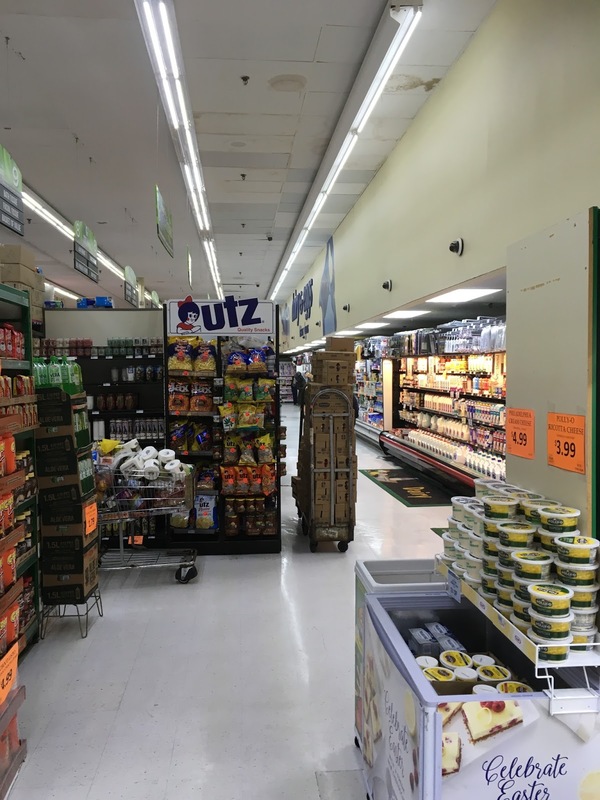 The service departments in the back of the first aisle have been opened, including deli, seafood, butcher, and a Halal butcher. Pretty standard deli with a good selection of Boar's Head products. Here's an overview of the new service departments, plus deli just to the left. Due to the area's large Muslim population, Halal meats are a focus here. Halal rotisserie chickens in the deli. There is even a separate butcher for Halal products. Seafood is just to the right in the back corner. Live fish are now available as well. Looking back up towards the entrance. I do wish the cases had been upgraded to closed versions. Although that's not a huge problem, since it feels like they keep the store at about 38 degrees anyway! The store's regular butcher caters largely to the area's Hispanic population. This store is much more international than some others, focusing on Latin and Middle Eastern products, although other parts of the world are represented as well. The owner, Willie Park, is Korean. The rest of the store retains its Food Basics decor. And by the way, eggs are still in the front corner (completely across the store from this sign). 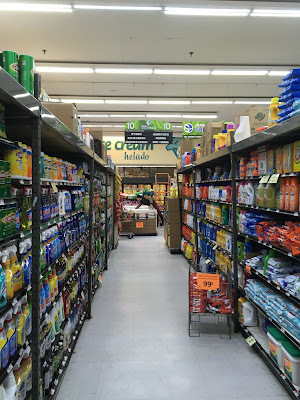 The aisles are largely unchanged, although this is different shelving from what Food Basics would have had. They generally used green shelves. There isn't much space near the deli, where bread and rolls usually are, so this case is instead located in the bread aisle. The grocery department is still largely value-based. Some of the prices are quite low. The slogan on this sign is left over from Food Basics, although the sign itself is new. As you can see, the aisles are very clean, as they should be. The store's selection of more upscale, natural, and organic products has increased as well. Looking along the back wall of the store. If I had two complaints, they would be the ceiling and the floor. Neither one is in terrible condition, but both could have been improved pretty easily. Frozen foods take up the last aisle. Once again, there hasn't been much of a change here, except maybe some of the product selections. The front end is largely the same, except for the addition of a service floral department in a former customer service counter area. Food Basics moved its customer service counter from this section to the far side of the registers in a renovation around 2010, but this area stayed empty after that. SuperFresh added this floral department later. The front end is also largely unchanged. This SuperFresh has something for everyone, and at prices that are (mostly) great. And that's a pretty extensive post for a little ol' Revisit!